With Senate Democratic leader Harry Reid now on board, President Barack Obama’s nuclear agreement with Iran seems to be picking up the momentum it needs to survive fierce opposition from its Republican and Israeli opponents. Reid on Sunday became the 27th and most powerful Senate Democrat to throw his support behind the president and the Iran nuclear deal, which could open the door for some of his non-committed colleagues to come aboard. “I strongly support the historic agreement and will do everything in my power to ensure that it stands,” said Reid, D-Nev., in a news release. It will take 34 votes in the Senate to stop Congress from scuttling the deal, and having Reid on the president’s side will make it difficult for opponents to muster the needed support in the Senate from Democrats. In the Senate, only two Democrats — Schumer and Robert Menendez of New Jersey — have announced opposition to the deal. Instead, a steady stream of Democrats have recently backed the deal, and Reid’s support will provide an opportunity for others to jump on board. The announcement also comes before Obama heads to Nevada. “I will do everything in my power to support this agreement and ensure that America holds up our end of the commitment we have made to our allies and the world to prevent a nuclear-armed Iran,” Reid said. Republicans and the Israeli government furiously oppose the deal signed by the U.S., Iran and five world powers, which seeks to keep Iran from building a nuclear bomb in exchange for billions in international sanctions relief. They say Obama’s agreement makes too many concessions to Iran and could actually enable that country to become a nuclear-armed state. Congress plans a vote next month on a resolution disapproving of the deal, which Obama has threatened to veto. Opponents would then need two-thirds majorities in the House and the Senate to override. House Minority Leader Nancy Pelosi already has said House Democratic supporters have the votes necessary to sustain Obama’s veto despite unanimous GOP opposition. Reid said he believes that the deal was the best that could be achieved. Iran has threatened to destroy Israel and Prime Minister Benjamin Netanyahu is vehemently opposed to the deal. 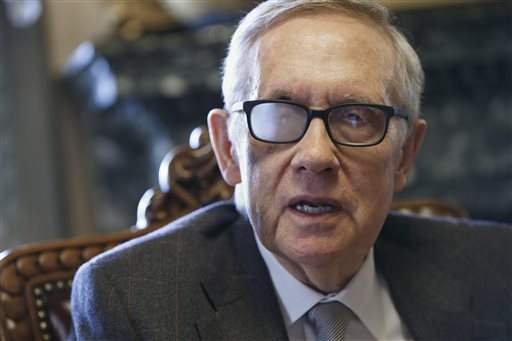 Reid said Israel’s security is “of utmost importance.” ”I support this deal because I believe it is the best option to halt any Iranian nuclear weapons program and therefore to protect the State of Israel,” he said.